DISCLOSURE: I received a free copy of this book through NetGalley from the publisher, Grand Central Publishing, in exchange for an honest review. It is fair to say that I am a bit over-the-top with my love of ice cream. 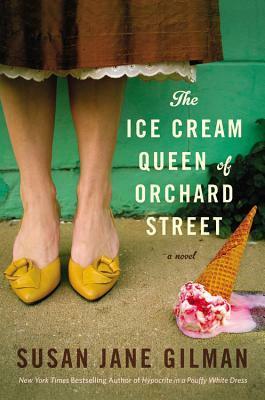 When you’re as obsessed with ice cream as I am, it is hard not to be intrigued by a book entitled The Ice Cream Queen of Orchard Street . . . even when it has a cover as bad as this one. I have been known to judge a book by its cover before (rightly, as it turns out, with books like Life After Life). And I almost did the same with this one. The mustard heels and the dowdy, old-fashioned brown skirt with the scalloped slip made me fear that this was just bland, chick-lit summer fluff. I was definitely wary. But the book billed itself as “An epic novel of a fierce young immigrant’s rise to become the greatest ice cream maker in America . . . and the events that nearly destroy her,” and the early hype was good. So, in the end, despite the awful cover, I decided I couldn’t turn my back on the ice cream. Luckily, this book is far better and more interesting than its cover would have you believe. Lillian Dunkle is the titular Ice Cream Queen. Born Malka Treynovsky in Russia, she and her family (Mom, Dad, and three older sisters) travel to New York in 1913, when she is six. In this 500-page first-person narrative, Lillian explains how she went from Malka Treynovsky to Malka Bialystoker to Lillian Dinello to Lillian Dunkle. She documents the highs and lows of her life (being trampled by a horse as a little girl, getting high with her grandson, marrying the best-looking man she had ever met, building her ice cream empire to over 300 franchises around the country, assaulting a small child on national television, getting drunk with a clown . . .). This is her rags-to-riches journey, spanning nearly seventy years, from the Jewish tenements on Orchard Street to her life of Chanel suits, vacation homes, and trips on the Concord. Were it not for my somewhat ridiculous love of ice cream, I probably would have given this book a 3.5. But the ice cream won me over. There are fascinating bits of ice-cream history woven seamlessly into Lillian’s story. Some are real (like the several pages dedicated to Giambattista della Porta’s recipe from 1558 for making frozen wine using saltpeter, complete with an explanation of the science that della Porta employed to freeze the wine) and some is entirely fictional (like Lillian’s husband’s invention of soft-serve ice cream). There are mouth-watering descriptions of ice cream, like Lillian’s first taste of gelato: “Unctuous, milky sweetness spread through my mouth like cold fire . 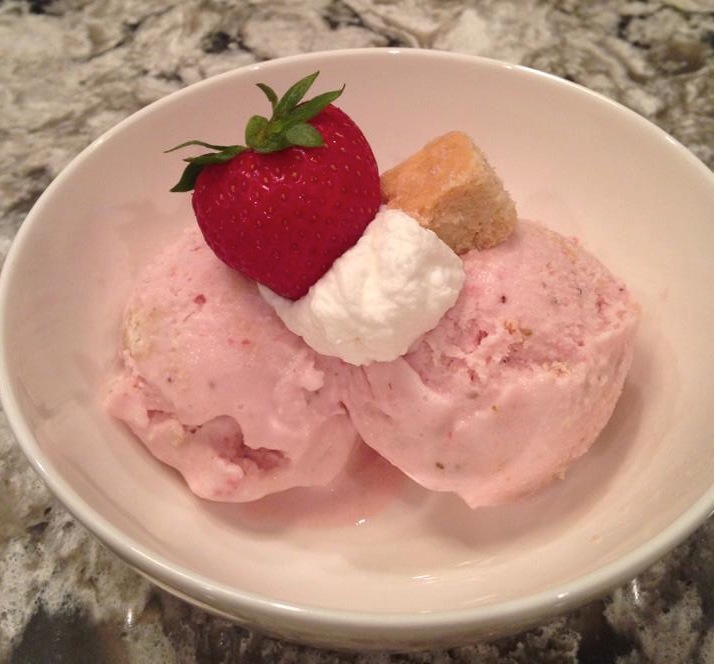 . . .” There are pages dedicated to flavors, franchises, ad campaigns, the invention of ice cream cones, and how to scoop the perfect (and most cost effective) ice cream scoop. Delightful ice cream factoids and descriptions abound. Even if you’re not the world’s hugest ice cream fan, this book will make you crave a delicious frozen treat. That’s not to say that this book is just some odd history that will only appeal to ice-cream fanatics. More than ice cream, this book is about Lillian Dunkle. Lillian is not an entirely loveable character. In fact, she can be vengeful, paranoid, and downright nasty. She is not afraid to take others down to get on top (“The desire for vengeance, darlings, it is like venom in your bloodstream. One drop can quickly take over your entire being.”). But she is also smart, scrappy, inventive, and funny. Her voice is strong and peppered with catchphrases (“So sue me,” “darlings”) and heavily sprinkled with both Yiddish and Italian, her two childhood tongues. She is unique and interesting, and even after 500 pages of her life story, you don’t grow bored with her. There are some books that have plots that you can tell are a bit fly-by-the-seat-of-your-pants. It seems like the author started with a seed of an idea and simply allowed the plot to unfold “organically” as she wrote. On the other end of the spectrum, there are books like this one: books that were clearly well outlined and planned from beginning to end. They have subtle plot points, the importance of which become apparent only once they resurface and are woven back in later in the book. These moments (combined with Lillian’s voice) help make this book read like a really fun, realistic (although utterly outlandish) memoir. Who should read it: Shana (i.e., fans of historical fiction and lovers of smart, sassy female characters—especially when they use words like “schmendrik” and “tuches” and “meshuggeneh” regularly); anyone who loves ice cream as much (or nearly as much) as I do. This entry was posted in Rating: 4/5 and tagged Book review, Book Reviews, Books, ice cream, NetGalley, Susan Jane Gilman, The Ice Cream Queen of Orchard Street. Bookmark the permalink. This book was fantastic! I’ve started recommending it as well. It’s refreshing to encounter a female protagonist who is not involved in a love triangle, has interests outside of her husband and son, and is often the smartest person in the room. Malka/Lillian/the Ice Cream Queen is whip-smart, funny, bitter, and a business genius. Plus, who can’t love the combination of ice cream and your Yiddishe/Italian grandmother? Oh, hurrah! My “who should read it” rings true! I’m so glad you enjoyed it. Obvs, I concur with all of your comments. Malka/Lillian is definitely not the nicest woman in the world. But let’s be honest: smart plus funny trumps nice in my book (pun intended).